Happy Groundhog Day! It was 76 degrees in Charleston today, so fitting that Phil predicts that Spring is near. 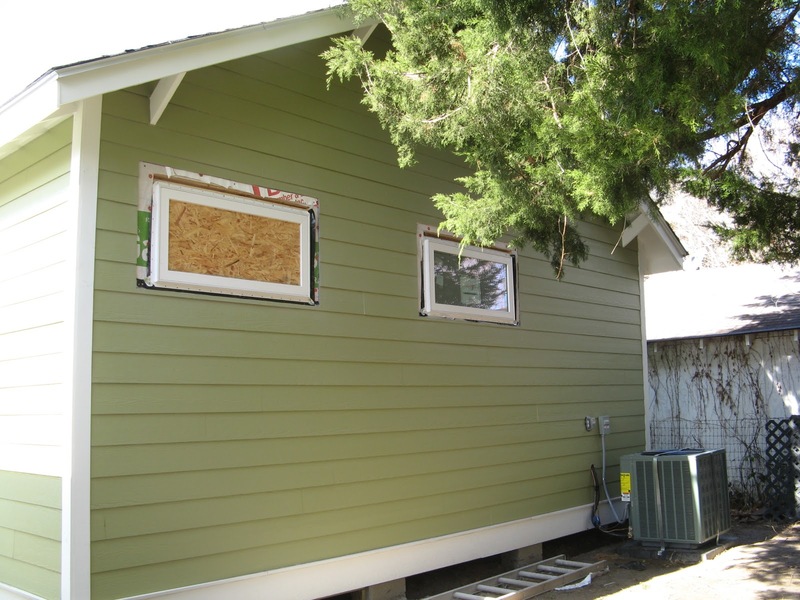 We went to the house at lunch today to finally work on our exterior punch list in the daylight. In the meantime, Thai & Kin from Stone Hands came over to measure the kitchen for our granite countertops. Those will be installed next week, woohoo! Also, Walt was there working on trimwork pieces, and he and AJ had installed the windows in the addition. Although, 2 of those 4 windows are temporary. One of the awning windows along the back wall was the one that was dropped by the delivery guy, so it currently has plywood in place of the glass. Buck Lumber will have to replace the glass once it comes in. The other temporary window is the large egress window that faces the shed. Again, Buck ordered the wrong size, so the guys have installed the right size window in that location, but the wrong style. 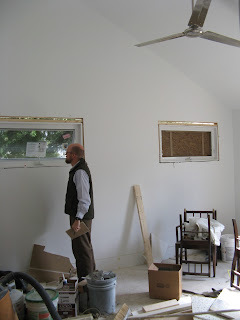 There is supposed to be a 3-over-1 window to match the rest of the windows in the house, but currently we have a 6-over-6? 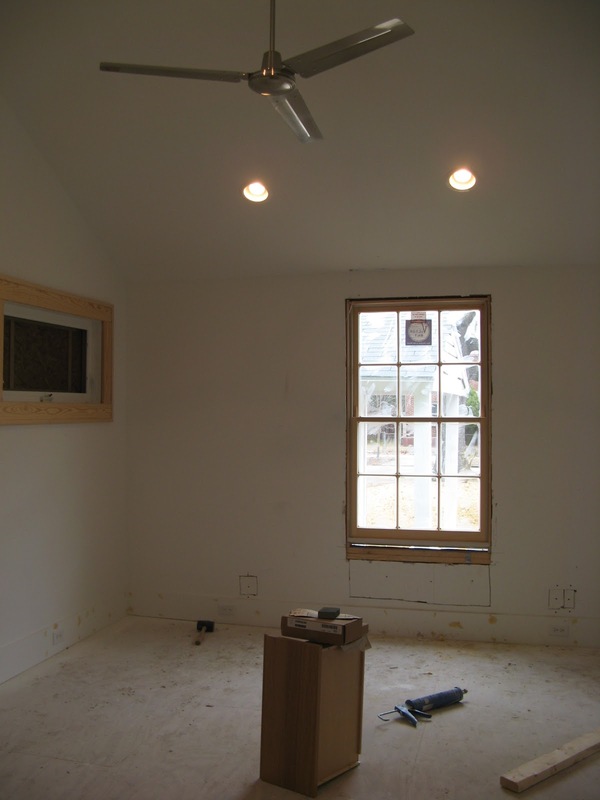 Regardless, we were able to see what the room looks like with natural light pouring in! They still need to do the trim around the windows, both inside and out, but here's a view of the exterior of the same wall. 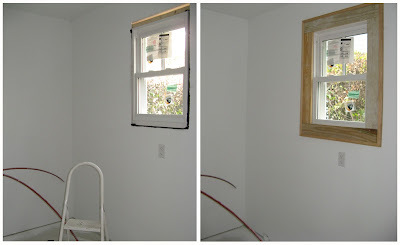 And the master bathroom's small 2-over-1 window! And now there is trim (updated 2/3/2011)! Jennifer do y'all know what kind of edge you want on the granite? I wish ihah done a bull nose finish it makes the granite look thicker. We actually prefer the eased edge. You know how particular we are about things being squared-off. Although on a different note, there will be a slight curve (in horizontal plane) at the corners of the overhang for the 'bar'. Figured it would save on injuries down the road.